Elaine fails at princessly details such as being sweet, fainting, and flirting. She also believes in magic, despite what her tutor says. So one day she ignores the voices of her tutor, her nanny and her sister, telling the sentry at the gate that she's on an educational quest for magic. With a deftly light hand and a healthy dose of humor, Sally Watson tells a delightful tale of magic and wonder. 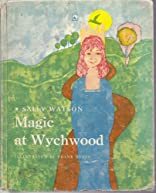 Magic at Wychwood is highly appropriate for all who believe -- or want to believe -- in magic and could be read aloud at bedtime over the course of several nights. About Frank Bozzo (Author, Illustrator) : Frank Bozzo is a published illustrator of children's books. Published credits of Frank Bozzo include The Whispering Mountain (A Dell Yearling Book), Whispering Mountain, and Magic at Wychwood. About Sally Watson (Author, Illustrator) : Sally Watson is a published author of children's books. Published credits of Sally Watson include The Delicate Pioneer, The Wayward Princess, Magic at Wychwood.